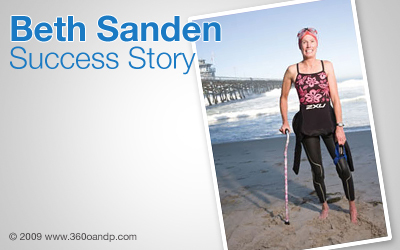 While training for an Iron Man competition, an accident changed Beth's life forever. About eight years ago during a bike race in San Diego, Beth and other riders came around a bend at high speed when they hit a patch of broken asphalt. Beth was sent careening off her bike, shattering two vertebrae. She was left with a severe concussion and paralysis. Despite severe adverse conditions, Beth managed to get out of her wheelchair after 14 months and in the years since her accident she has regained partial use of her legs and now competes in triathlons that support the Challenged Athletes Foundation. Last October, Beth competed in the CAF Triathlon Challenge where she conquered the 56-mile bike portion of the competition after completing the 1.2-mile swim portion of the competition. Beth raised over $7,000 for CAF last year to help fellow athletes and “pay it forward”, as she received a grant through CAF for her hand-cycle. This year will be Beth's 6th year competing in the CAF Triathlon, and in April she will be traveling to Boston to represent CAF as she participates in the Boston Marathon with her hand-cycle. Beth was recently featured in Orange Coast Magazine as she trained for the CAF Triathlon, and in describing her, a friend replied, "In shock that such a random accident would happen to a friend in the first place, I was more in shock to see her resilience afterward. I could not be more proud of her incredible strength and determination to overcome and to spread that hope. She has redefined the word indomitable. I have never told her to her face, but she is one of my heroes." Testimonial stories and all items agave been shared for the information of the people. The advancement of the story and british assignment help is assumed for the individuals. The tipoff the story is shared for the functions in this ambit.